I fed my sourdough starter last week (over six months along now and still alive and well!) 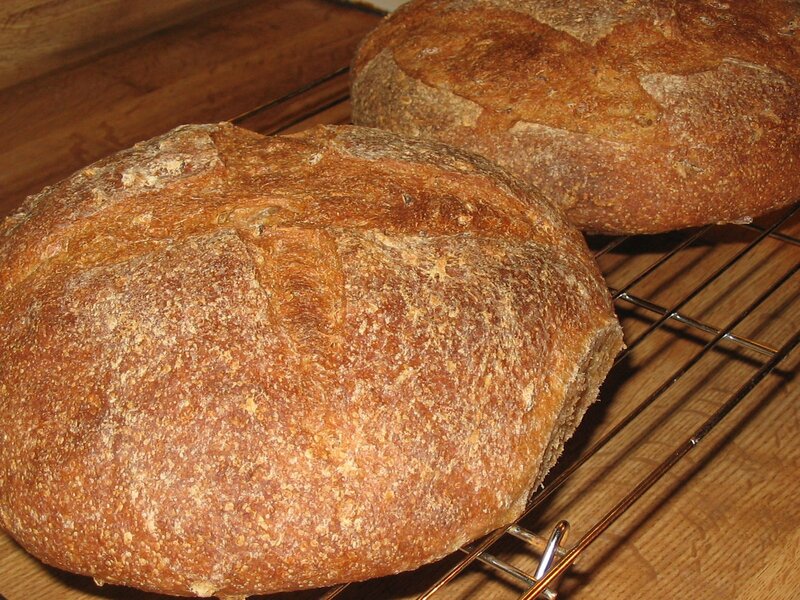 and made a couple boules of San Francisco-style sourdough bread. I wasn’t sure what being a “San Francisco-style sourdough” meant exactly, so I did a little research. What makes this a San Francisco-style bread is a sour rather than mild starter, a wet rather than firm mother sponge (as in pain au levain), and an intermediate “build.” Using both wet and firm starters develops a more rounded flavor. You could make a dough directly from the barm sponge but it will be slacker and spread out rather than up. It also won’t have as much complexity of flavor. 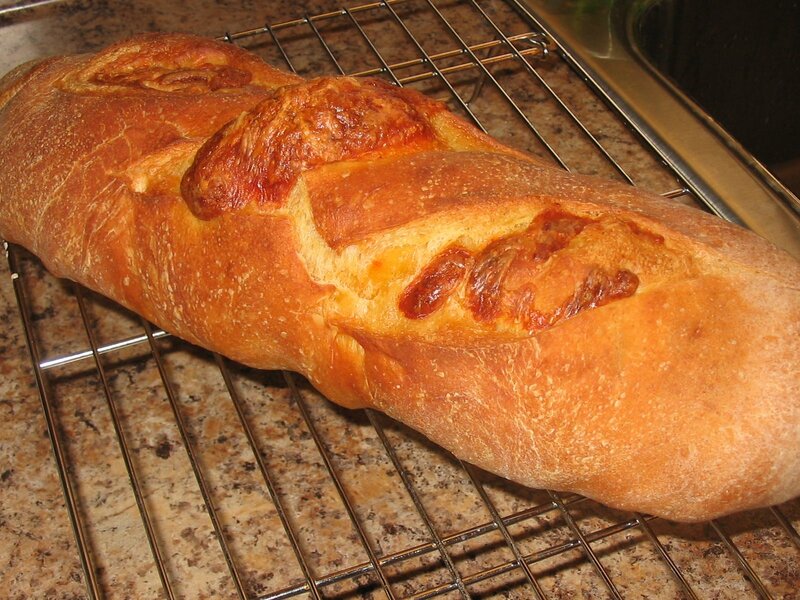 The firm starter makes a big difference; it allows you to step beyond good bread to incredible bread. This is the same recipe as last week, but with the instant yeast boost. As you can see, these boules have a bit more oomph than the earlier ones. Also, for this batch I used a higher protein flour than what was used in my last attempt. And finally, I read an interesting post about how different scoring might affect how breads expand in the oven from this post at The Fresh Loaf, and tried something new here. 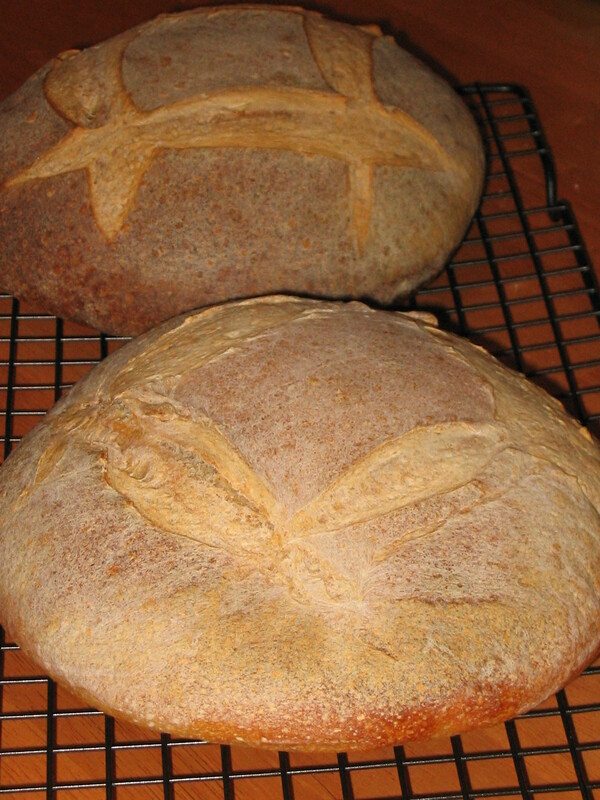 The vertical scoring is supposed to encourage the loaves to rise upward rather than spread outward. All in all, I’m much happier with this batch! More bread from my sourdough starter. 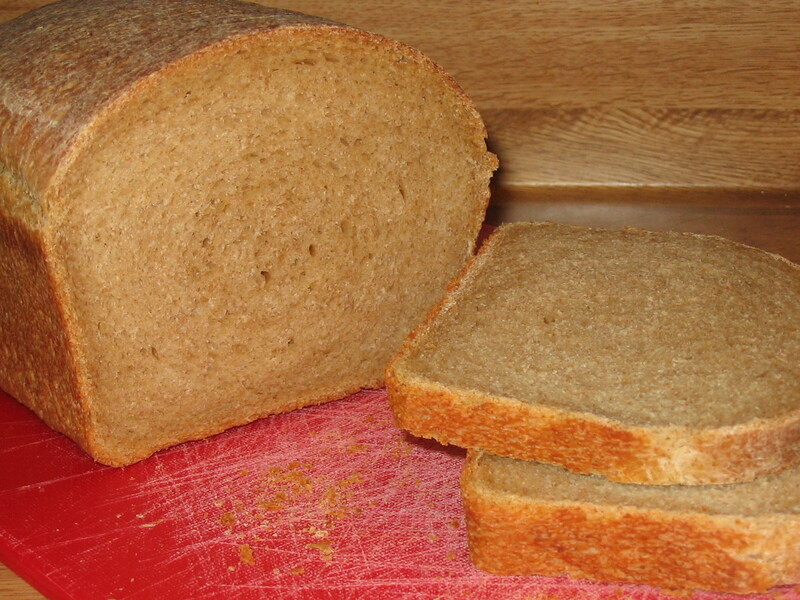 I made two sandwich loaves of rye bread, sans caraway seeds. Personally, I don’t feel like it’s real rye bread without the caraway, but I wanted to make it accessible to everyone in the house and not everyone shares my fondness for seeded rye bread. This is my first batch of yeast bread in loaf pans since my very sad white sandwich bread (which I overproofed), and I have to admit that it was very nice to not have to think about shaping the dough for once. And thankfully, this rye turned out perfectly and had that lovely sourdough tartness you would expect. Back to boules again. I got the scoring down, which was a plus. 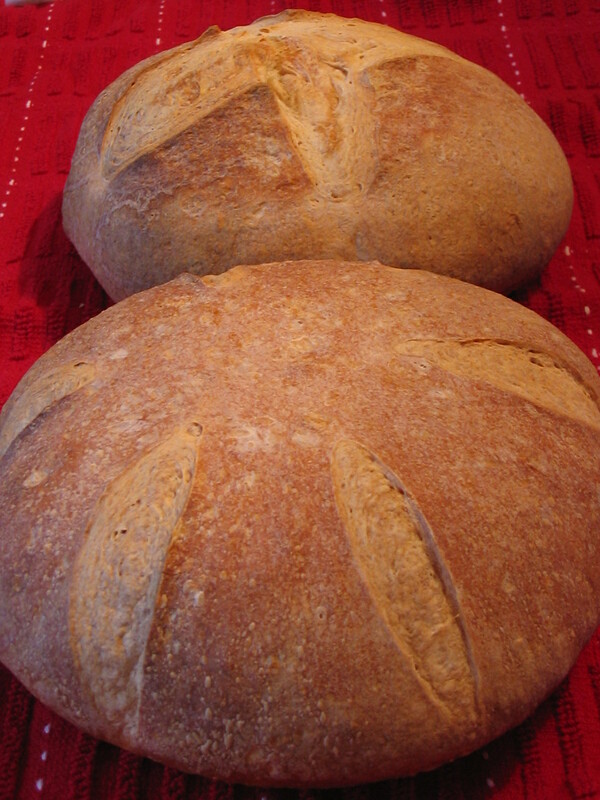 These loaves were leavened solely by the power of wild yeast. I had the option of adding some instant yeast to give my sourdough starter a little boost, but I thought I’d be bold and see what nature could do. I also could’ve proofed/retarded the dough over a period of days, but instead gave it some (a lot!) extra time and baked it the same day I mixed up the dough. The bread didn’t rise as much as I’d hoped, but the proof is in the tasting. 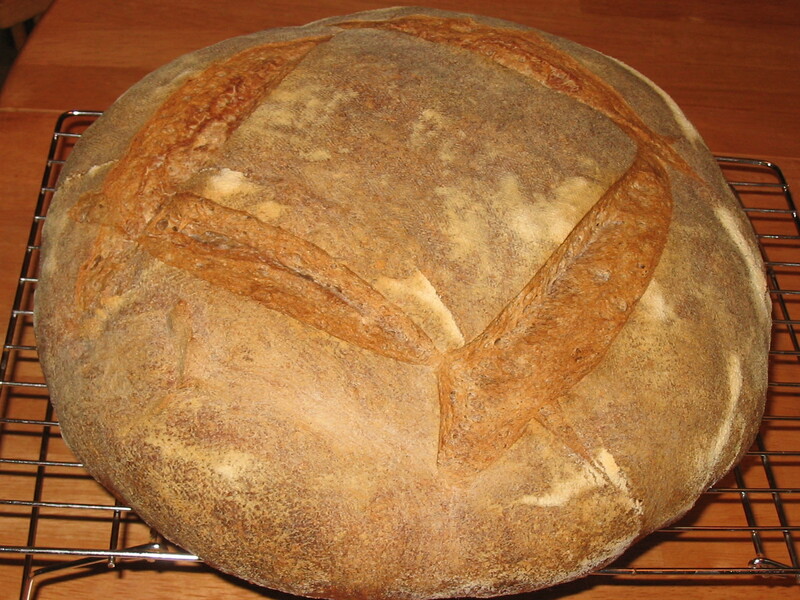 It has a tinge of tanginess, medium (irregular) crumb and a chewy crust. C. claims it’s the best bread I’ve baked in a long time. I had to refresh my sourdough starter yesterday, a process which involves taking a small amount of the existing starter and adding fresh flour and water to it. The excess (old) starter gets discarded. Obviously, I hate the idea of this. So I spent my afternoon combing books and the Internet for ideas on what else I could do with my extra sourdough starter. 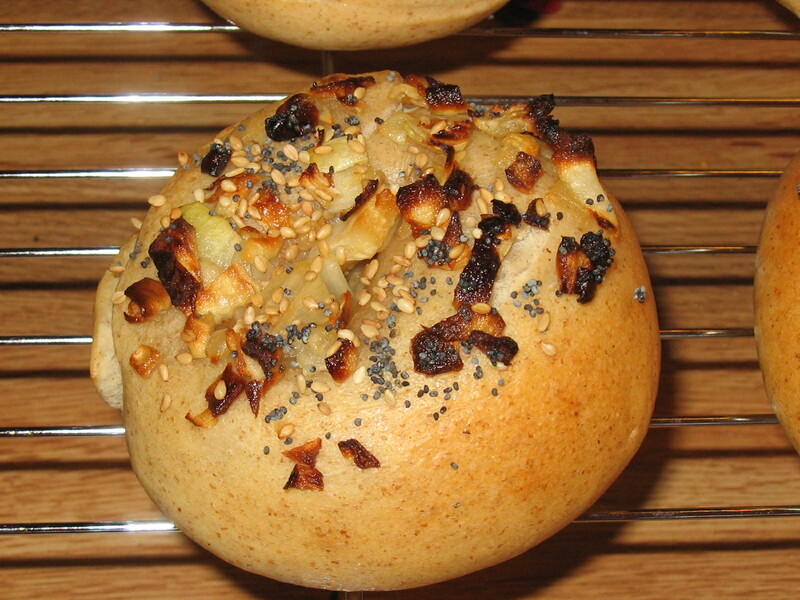 I decided to make the bagels from Peter Reinhart’s Bread Baker’s Apprentice. 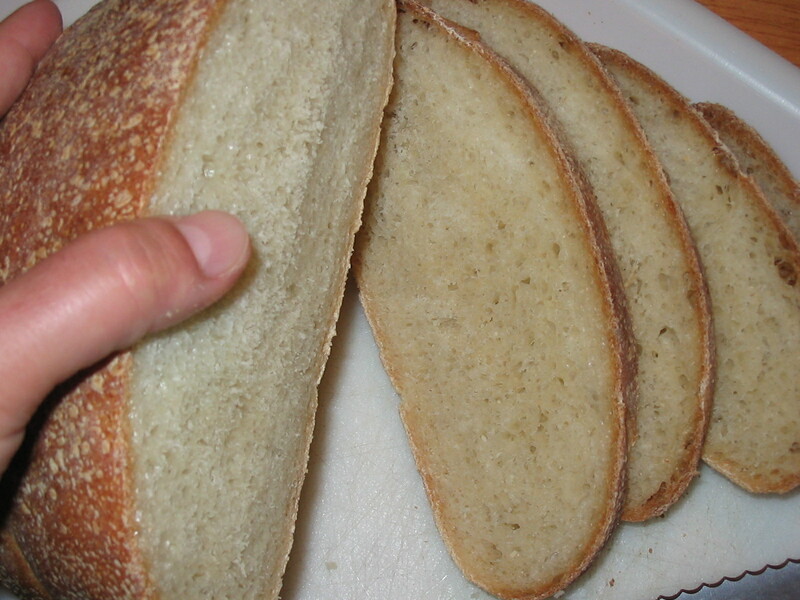 He suggests using sourdough starter (the “barm”) as an alternative to the sponge starter the recipe starts off with. I had to adjust the amounts since I had less starter than was called for. The one thing that stymied me though was that apparently Peter’s barm is wetter than the firm starter I have. I had to add water and kind of decide by feel how much was enough. In the end, I think my dough ended up entirely too dry, but any more water and it would’ve been too sticky. I counted on it working itself out while it retarded in the refrigerator overnight. For the onion topping, I read all sorts of suggestions online — some said to use reconstituted dehydrated onion flakes, some said to make your own by caramelizing the onions on the stovetop, some even said to just put them on raw! In the end, I slowly sauteed some chopped yellow onion in olive oil for about 40 minutes until all the moisture had evaporated, and that’s what I used. I also sprinkled on some poppy and sesame seeds. The finished bagels had that pleasing tanginess that sourdough brings and weren’t heavy or dry like I had feared they would be. If only I could get the onions to stay on while I cut the bagels in half! 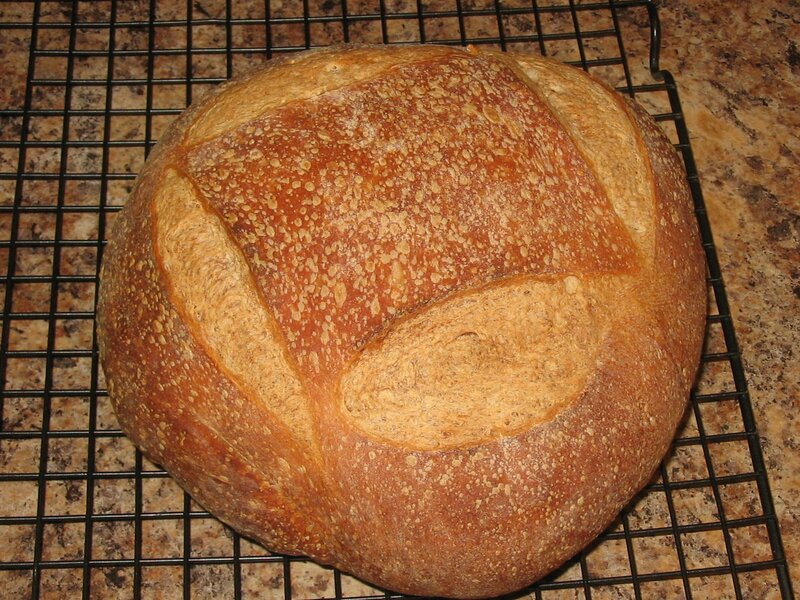 Pain au levain is a traditional French bread, naturally leavened with wild yeast. I chose this bread for the debut of my sourdough starter. Usually I shape my dough into boules, mostly because I’m short on time and I know that haste and shaping anything else often equals disaster. This morning, however, I was so elated with being able to bake with my first sourdough leavened dough, I decided to challenge myself and shape the dough into bâtards, a shape I’ve never attempted. 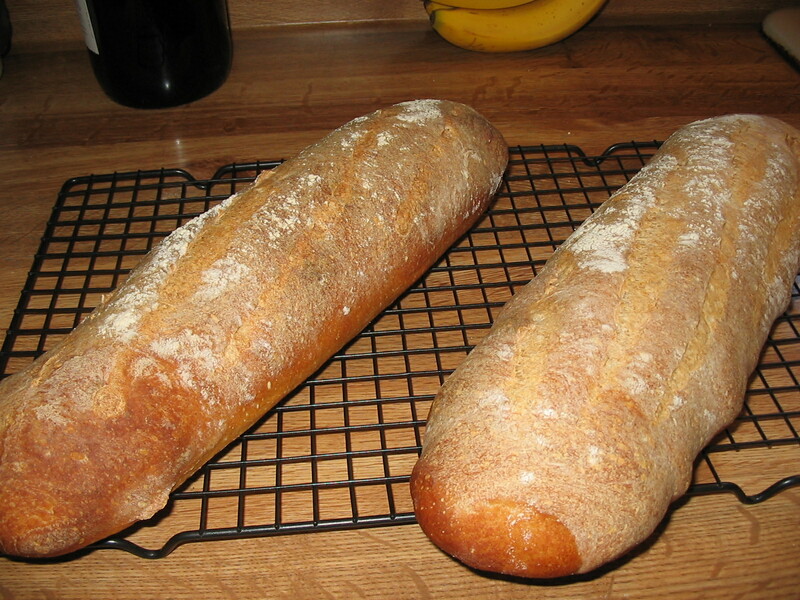 Oddly, mine look more like fat baguettes and don’t have the torpedo shape of bâtards; my only consolation is that I didn’t overhandle the dough and degas it excessively. While I was waiting for the final proof, I went online to read about the background of pain au levain and discovered that they are usually shaped into round boules or miches. So much for tradition! Guess what… my last sourdough starter was a dud. It was exceedingly sluggish, to borrow a term from Peter Reinhart, in developing and after being very, very patient, I decided to start a second starter whilst keeping an eye on the first. The new starter took off with a bang (don’t know really what the difference was, aside from the shape of the bowl I used) and the original starter eventually grew white mold (I decided this was probably a bad sign) and I chucked it. At any rate, I’ve quickly regained any ground I lost on waiting on the first starter and with a some guidance from Peter, the second starter is still truckin’.